In January 2017, Entergy Nuclear and the state of New York reached an agreement to retire the two nuclear reactors at the Indian Point Energy Center, located in Buchanan, New York, about 25 miles north of New York City. Indian Point is one of four nuclear power plants in New York state and accounts for about 12% of total electricity generated from all sources statewide. Under the agreement, Entergy will retire one reactor in April 2020 and the other in April 2021. Entergy had been seeking a 20-year license renewal for both reactor units from the U.S. Nuclear Regulatory Commission since 2007. However, New York state challenged the renewals as a result of environmental and safety concerns because of the facility’s proximity to New York City. The announced closure dates could be postponed by four years given a mutual agreement between Entergy and the New York state government if electricity reliability in the region is significantly affected or if other emergency circumstances arise. Indian Point operates two pressurized water reactor units, each with a licensed capacity of 1,072 megawatts (MW). These two units began commercial operation in 1974 and 1976. A third, smaller reactor opened in 1962 and was shut down in 1974 because the emergency core cooling system did not meet regulatory requirements. With a total capacity of 2,144 MW, Indian Point represents 40% of the state’s nuclear capacity and 5% of the state’s total installed electricity generating capacity. Although Indian Point represents 5% of New York’s electricity generating capacity, the plant provides about 12% of the state’s total electricity generation. Nuclear plants tend to operate as baseload generators, providing more electricity throughout the day compared with other plants that are more likely to operate during times of high electricity demand or, in the case of some renewable generators, when their resources are available. 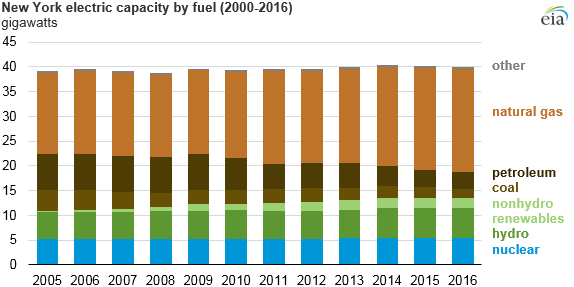 Based on the latest annual data for the United States, an operating nuclear power plant typically has a capacity factor of about 90% versus 55% for combined-cycle natural gas and 30%–35% for wind, for example. 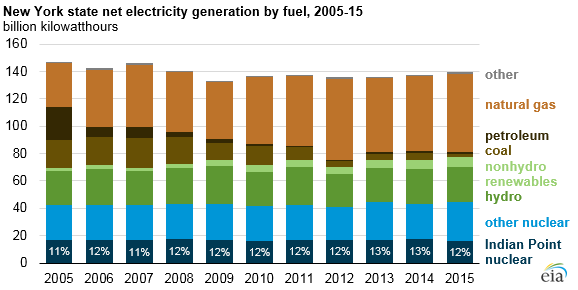 Natural gas-fired generation accounted for 41% of New York’s electricity generation in 2015. 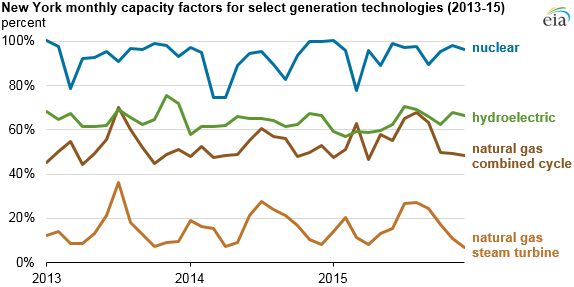 Over the past several years, combined-cycle natural gas plants have become more competitive as a form of baseload electricity generation. Relatively low natural gas prices and new infrastructure projects increased the amount of natural gas able to be delivered from production areas in Ohio and Pennsylvania to demand centers along the Atlantic Coast. New York's recently announced Clean Energy Standard seeks to add more capacity and generation from nonhydro renewable sources such as wind and solar photovoltaic. Although there are differences between the technologies that qualify for the Clean Energy Standard and those included in EIA's category, nonhydro renewables accounted for about 5% of New York's electricity generation in 2015. New York's Clean Energy Standard requires that 50% of the state's electricity generation comes from renewable sources (other than large hydro) by 2030.